Blaise Pascal (1623-1662), the French philosopher and scientist, was one of the greatest and most influential mathematicians of all time. He was also an expert in hydrostatics, an inventor, and a well-versed religious philosopher. Born at Clermont-Ferrand on June 19, 1623, Pascal’s father was Étienne Pascal, a local judge and later a tax collector. His mother, Antoinette Begon, died in 1626. He was the second child of three children and the only son. The Pascal family settled in Paris in 1631 and later they moved to Rouen in 1640. At a tender age of 12, Pascal began participating in the meetings of a mathematical academy. He learned different languages from his father, Latin and Greek in particular, but Pascal Sr. didn’t teach him mathematics. This increased the curiosity of young Pascal, who went on to experiment with geometrical figures, even formulating his own names for standard geometrical terms. Pascal wrote an important short work on projective geometry, “Essay on Conics” aged just 16. Pascal’s Theorem, also known as the Mystic Hexagram, states that opposite sides of a hexagon inscribed in a conic, intersect in three collinear points. By 1642 Pascal’s father was now a tax collector for the French city of Rouen. To help his father, Pascal invented a calculator called the Pascaline. This mechanical calculator was able to add and subtract and used a numerical wheel with movable dials. The calculator could not work correctly with the French currency; at that time there were 20 sols in a livre and 12 deniers in a sol. Pascal continued to refine and improve his calculator for ten years, although his calculator was not a commercial success. During the 1640’s Pascal contributed to hydrostatics. This is the branch of fluid mechanics that studies fluids at rest. In the course of his experiments, he invented the syringe and the hydraulic press. Pascal carried out experimentations with air pressure. He confirmed Evangelista Torricelli’s theory concerning the cause of barometrical variations. By 1647 he had proved to his satisfaction that a vacuum existed and wrote “New Experiments Concerning Vacuums”. His theoretical work on the equilibrium of fluids led to his work “Treatise on the Equilibrium of Liquids” in 1653 in which he explained Pascal’s law of pressure. The Pascal principle states that when there is an increase in pressure at any point in a confined fluid, there is an equal increase at every other point in the container. Pascal also studied conic sections and produced important theorems in projective geometry. His work on cones, “Generation of Conic Sections” was started in 1648 and continued in 1653/4, but not completed. He also studied the Pascal Triangle, making many new mathematical observations. This is a triangle where each number is the sum of the two directly above it. The triangle was used to prove Pascal’s Identity. This is a useful theorem of combinatorics dealing with binomial coefficients. His work “Traité du triangle arithmétique’” (“Treatise on the Arithmetical Triangle”) was published in 1653. 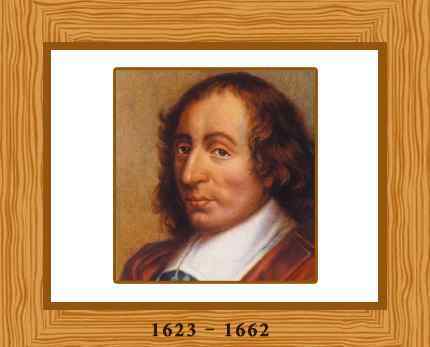 In 1654, Pascal began corresponding with mathematician Pierre de Fermat. He conducted experiments with dice and discovered that there was a fixed likelihood of a particular outcome. This was the beginning of the field of probability. Fermat and Pascal are today recognized as the co-founders of probability theory. In his effort to create a perpetual motion machine, Pascal inadvertently devised the now well-known gambling device, the roulette wheel. Pascal had a deep religious experience in 1864 and the following year he entered a religious institution a Port-Royal. There, he wrote religious letter under the pseudonym Louis de Montalte. These were later published as “Les Provinciales” (The Provincial Letters) and he also wrote his famous philosophy work “Pensées”. Pascal’s final work was on the cycloid, the curve traced by a point on the circumference of a rolling circle which he studied in 1658. Blaise Pascal died of a stomach tumor on 19 August, 1662 at the young age of 39. The Pascal (Pa) unit of pressure was named in his honor. The computer language Pascal is named after him in recognition of his early computing machine.